iPhone owners that enjoy taking photographs and video on their iPhone 5 and 5S smartphones might be interested in a new iPhone Anamorphic Adapter lens which has been created by lens creator Scoot Cahall of Moondog Labs. 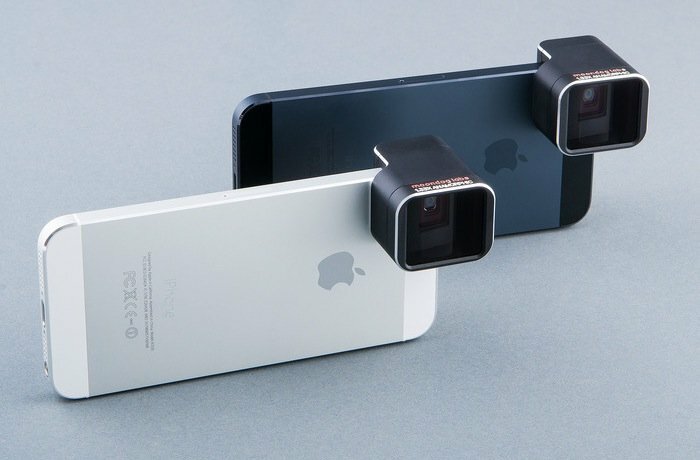 The iPhone Anamorphic Adapter lens enables your iPhone 5 or 5S smartphone to capture a 33% wider but not thinner scene onto the smartphones sensor. Which after being de-squeeze offers a 2.4:1 aspect ratio. The Anamorphic Adapter also works the same way for still photographic mode, transforming the native 4:3 aspect ratio to panoramic 16:9. Inventor Cahall explains a little more about the technology and design of their new lens. “There are many free or paid software packages available to de-squeeze video or still images created with an anamorphic lens – for example Final Cut Pro or Handbrake for video, and Adobe Photoshop or GIMP for still images. For the best workflow, we are working with FiLMiC Pro to incorporate a 1.33x anamorphic de-squeeze in their first quarter 2014 release for full in-app compatibility with the Anamorphic Adapter. To help you through the de-squeezing process, we will post simple instructions on our website and link to them here on our Kickstarter project page. The iPhone Anamorphic Adapter lens project is currently over on the Kickstarter website looking to raise enough pledges to make the jump from concept to production. So if you think the Anamorphic Adapter is something you could benefit from, visit the Kickstarter website now to make a pledge and help the iPhone Anamorphic lens become a reality. You might also be interested in the Olloclip 3-1 Macro lens kit that were released earlier this week as well.